Sri Lanka is a truly gorgeous country near India with friendly people, sprawling jungles, tons of interesting wildlife, and endless beaches. I spent just shy of three weeks there and found it to be a perfectly feasible budget destination, with cheap transportation options, reasonable food costs, and decent room rates. 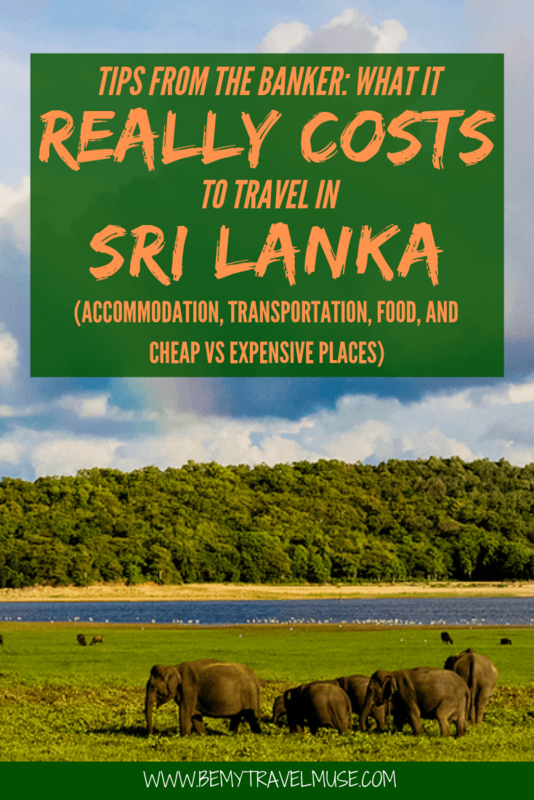 Like most countries, Sri Lanka can be seen on a backpacker budget, or one can spend a small fortune there. The biggest kicker was the price of activities, such as safaris, and admission into the UNESCO World Heritage sites. With each running about $40-$50 per ticket, this made Sri Lanka more expensive to fully explore. That said, skipping these activities would have meant missing out on a big reason why Sri Lanka is such a wonderful place to visit. My daily average came out to $50/day. This may come as a surprise since I spent about 8 months in Southeast Asia previously, averaging about $30/day and doing things as cheaply as possible. Part of that was out of necessity, but mostly, I just saw it as a personal challenge and I wanted to see if it was doable. Now I know, and I’m simply not as willing to do things so cheaply these days. I tend to want my own room more, I want to stay in nicer places, I have been moving more quickly lately, which makes the costs add up, and just haven’t been trying as hard to do everything on a shoestring budget. That said, Sri Lanka can be done on closer to $30 per day on the days that you don’t pay for expensive activities. Food, transport, and accommodation are relatively cheap. I didn’t stay in any dorms while in Sri Lanka. Given I’m a solo traveler, this meant I had to book private rooms and shoulder the cost myself. I typically spent about $10-$15 per night on a room, but some nights spent a lot more wanting to stay somewhere nice. Budget accommodation was easier to find in the more touristy towns, such as Galle, than the lesser-visited places such as Dambulla. 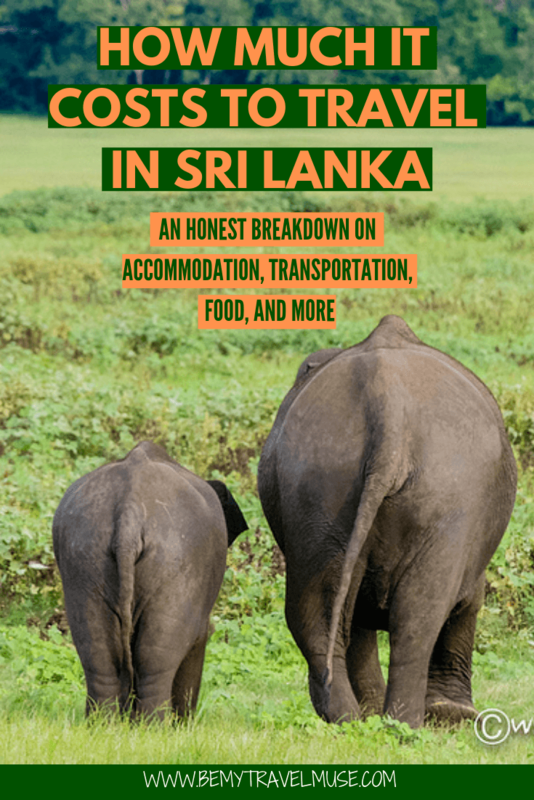 Sri Lanka isn’t as much of a backpacker destination, so the options are just not as plentiful as in, say, Thailand, where a $5 dorm room is easy to find, but you can definitely find hostels with reasonable price and great facilities in all major cities. If, like, me, you’d like to mix in a few nights of nicer accommodation, I recommend Amaya Beach Resort on Passikudah beach. and Trinco Blue in Trincomalee! There are a lot of varying price options for transport. It’s not atypical in Sri Lanka to hire a car and driver, which usually runs about $50 per day. The driver tends to sleep in the car, or your accommodation of choice will have sleeping quarters for the driver. He covers the associated costs though you tend to cover his food when he’s on the clock. During my first week there, I split this with a friend who was on a much shorter trip. We explored the places the train doesn’t access this way. Otherwise, buses are a very cheap option at just a few dollars for a 6-hour ride, though they are typically packed until it’s standing room only. People continue to pile into the point that they get very uncomfortable. I rarely came across one with air conditioning. Tickets are sold on board and buses leave when full. Taking the train was my personal favorite option. Pricing for the second-class cabin ran anywhere from $1.50 to $4 and was a real delight. These also sometimes run out of seats, though, meaning you may have to stand or sit on the floor. The food is delicious in Sri Lanka, but unfortunately, lunches are often a buffet that has been sitting out for a while. I was able to get around this by visiting roti stands around lunch time where the food was made fresh. Typical lunches ran about $3-5, though it’s somewhat common for a driver or tour guide to take you to much more expensive lunch places that run about $20. You simply have to say you’re not interested in that type of place. Beer was nice and cheap at around $2-$3 for a large bottle. Dambulla was the most expensive simply because Polonnaruwa and Sigiriya Rock charged a rather ridiculous admission fee of around $30 each for a foreign visitor. Safaris in the area were also a bit steep at around $60 per person. Galle, Ella, and Kandy were cheaper given they had more accommodation options and are easier to get around. Besides, most of the activities here involve visiting tea plantations or going on hikes, both of which are cheap or free. I found that the accommodation ranging between $20 and $60 was actually no better than the rooms that cost more like $10-$15. There really didn’t seem to be much reason to spend over $10 on a room in Sri Lanka, unless one stays at a luxury hotel or apartment for more like $90+. SIM cards in Sri Lanka are nice and cheap running at about $10 for 3 gigs of 3G (on the Hutch network, which worked very well and can be purchased at the Colombo airport). Topping up only cost a few dollars as well. I did have trouble getting my iPhone 4 to tether to my computer, though. I haven’t had similar issues with SIM cards in Southeast Asia. Overall, Sri Lanka can be a cheap place to visit, but the cost of activities can really drive up the price. Missing out on the UNESCO sites and safaris would have really been unfortunate. 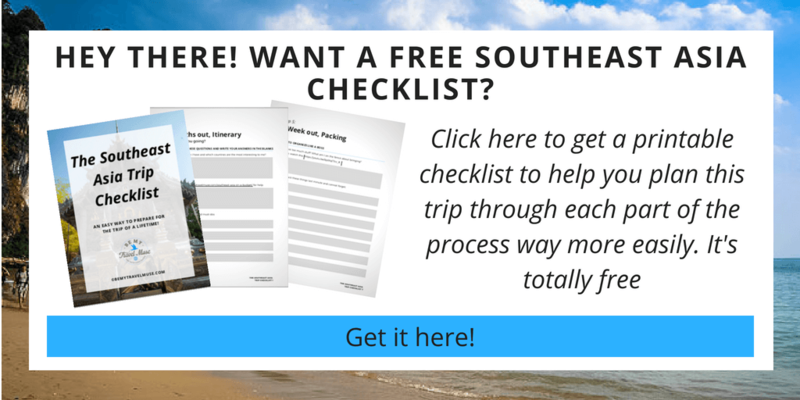 Consider this when planning your trip! Great and helpful post. The plan is to try to make it there when I’m in SE Asia so it’s nice to see that it’s still affordable even with all the activities and UNESCO sites. You could pop over from Kuala Lumpur for not too much cash. Sometimes a shoestring budget taints a trip or taking a bus 24 hours to save some cash is more detrimental. I’m sure you could have done Sri Lanka within that $30 cap, but it seems like the extra spending went to some amazing activities. I’m about $30 a day, though rarely do I reach it in Thailand. But still, I also haven’t been doing many activities. Sometimes I’m feeling like I’m missing out, others I feel vindicated in my savings, but it’s always best to do what you want and try to keep it within a reasonable range. Well, in SE Asia for example, I skipped the Gibbon experience in Laos, spend the extra time on busses, and did things like climb Kinabalu in one day because two days cost too much. BUT I never skip out on SCUBA diving. It’s your vacation, your life, and money is supposed to support that, not make it harder or less enjoyable! This is a really informative post!! I’ve never thought about traveling through Sri Lanka. My grandparents lived there for a while when I was a kid and always sent me cool postcards from there. This has sparked an interest…thanks! True, but then you have to think, when will I be here again? If it’s what you went there to see then, it is what it is, sadly. Great post, really happy to see this ahead of my trip to SL next week! Did you go to Unawatuna when you were in Galle? That’s where I stayed. They’re neighbors 🙂 My least favorite place, though. I loved the center the most. Um, yeah… We did Sri Lanka as a holiday, back in the glorious days when we had paychecks, so didn’t really mind splurging a bit. The UNESCO sites are expensive though – but worth it, as you say. We traveled mostly by bus and train, with the occasional taxi when nothing else was available. I wouldn’t say it was our cheapest holiday (although food was amazing and we hardly spent any money on it), but it was one of the most memorable – we actually wrote a roundup post recently, all from memory. Would be curious to see how much the country has changed since we visited. Great post, congrats! Good luck and safe travels! When was that? I’d say the food and transport is still cheap but I sincerely can’t comprehend why the UNESCO sites cost so much. it’s so frustrating to see that only foreigners pay those prices too, but that’s the case all over SE Asia as well. Sri Lanka just seems absolutely incredible! It is definitely a place on my list. Did you visit Indian while you were over there? I have been curious about going but haven’t made up my mind. Glad you had a great time, I love when you do your tips from a banker it is extremely helpful! and p.s. My pacsafe arrived today and I just purchased my travel insurance through your blog! Hope it helps & happy travels! I’ve never been to India but I really want to check it out! Interesting post. This information is extremely important, especially for planning a vacation trip to suit any budget. This will be a reference for me. I really want to vacation in Sri Lanka, but the information that I get a little still. and it will become a reference that could facilitate our holiday in Sri Lanka. nice post. I really like your blog! I’m planning to head over to Sri Lanka this summer, I’ve been all over SEA and am not usually overly worried about warnings (if you dress appropriately and go with your guts everything’s usually fine), however the negative comments about traveling solo a female in SL seem quite numerous.. I was wondering how you experienced traveling solo through the country? Really? What have you heard? I felt totally fine there! I’ve just booked my flights to Sri Lanka to coincide with Esala Perahera in Kandy: a festival I know will push the price of accomodation waaaaay up, but will be worth it. Asides from they days where I’ll do a safari in Yala and visit Sigiriya, I aim to keep my budget under $25 a day! I think it’s doable: There are now a number of cheap hostels with dorms for under $10 a night and great reviews. Thanks for getting me that little bit more excited. Glad to see the amount of hostels is growing. That must mean tourism is on the up and up. Have a great time and yes, I think you can keep it under $25/day if you take public transport instead of private and eat at the roti-type of food establishments rather than at expensive restaurants. Hey ! we are going to sri lanka in two weeks ! can you give any contact to your private driver ?? Great post, thanks! I had a question about traveling solo as a female, I’m going for about $40 a day (with the expensive cultural sites factored in too) . It sounds like you didn’t feel threatened at any time: other than the usual (conservative dress, no traveling at night, keep watch on your stuff, be confident), is there anything else that you think really helped you feel at ease and have a good trip?? For context, I will be alone only in Ella and the Cultural Triangle area (and getting between them on busses and trains). Thanks again! Hold your head up high and act confident, even when you don’t feel confident, and listen to your gut instincts. It’s a friendly place and I didn’t feel threatened there. I’ll be there again in June! I expect it to be similar, though. Great post! really appreciate the information. When traveling to different cities did you know prior to your arrival that there would be rooms for $10-15? Or was it like you showed up a looked/asked around. I definitely want to see as much of the island as possible but i definitely don’t want to get caught paying 90+ at some hotel because I wasnt able to locate a more affordable rate close by ya know? and this personal driver will take you literally anywhere for $50 per day (plus food and accommodations)? I just showed up and asked. A lot of places aren’t online and you can’t book ahead. I don’t usually plan ahead in Asia unless it’s a major holiday and that’s never been a big problem. Yes on the question about the driver. I have been wondering about the high costs in Sri Lanka. Tax seems to be the issue. I still think it’s pretty cheap. Is $50 a day including safari’s and scuba? I’m also wondering if you found it cheaper to book things like the safari when you got there? Sometimes that can cost extra, depending on how many people you can split the safari car with. Yes I always book in person in developing countries. Much cheaper in general. I want to just go to the Kathirkamam murugan temple from the airport. stay at night and visit the temple next day morning and fly back to Kul. What is the best option. I do not know anyone in Srilanka. any tour company or taxi you recommend? I actually use Uber there and think it’s great!